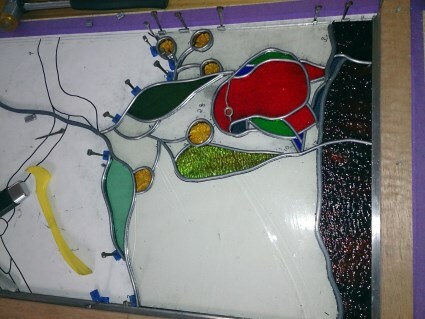 I've always been drawn to glass, and I was hooked after taking a class and then creating my first leadlight panel. That was over twelve years ago, and from my small and humble beginnings I have now taken over our garage with a collection of glass and associated accoutrements. Up until this project, everything I had designed had been done the old-fashioned way: by hand with pencil and paper. I had been considering Glass Eye 2000 for a while, and after experimenting with the trial version I knew this was the way to move forward. Having recently been made redundant from my job, I decided this was the time to start making my glass investment pay! I am drawn to birds, having done a number of Australian native birds in both lead and copper foil. My clients (my aunt and family) were moving from tropical Queensland in Australia to a cooler clime in southern Victoria and were disappointed to be leaving their existing leadlights of rainbow lorikeets behind. 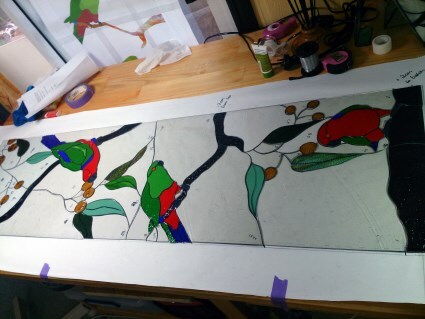 They asked that I design a panel for their new home depicting king parrots, a bird indigenous to their new location. They wanted to show the birds in a natural setting and nothing too fussy. The panel was going to be residing in their kitchen, resting on the bench and against one wall. This was the perfect opportunity to try importing photographs and using the email function to send preliminary pictures. The whole process was surprisingly easy. I liked the fact that I could enter the size of the panel and resize it with a few clicks. Pricing has always been a bugbear as well, so I particularly appreciated that Glass Eye 2000 did it all for me. After printing out the design to get the full picture and to see how everything flowed, I was ready to go. Just a few minor adjustments here and there and then the fun began. 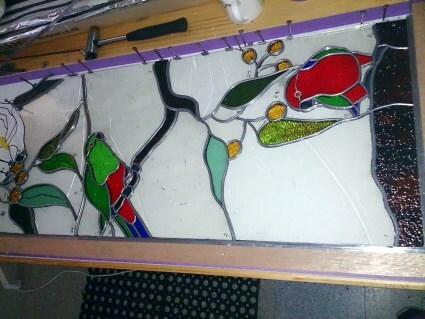 As this was a rather tall and narrow panel, the first decision was to use reinforced lead near the middle to support the weight of the glass above. I had originally chosen a clear baroque for the background as I love the suggestion of a breeze moving through the glass. Unfortunately, this was unavailable at the time and would have taken too long for our local shop to acquire. This turned out to be a stroke of good fortune, and I was able to purchase some beautiful mouth-blown antique glass in a reamy/seedy texture. There was only just enough to complete the panel, so I was lucky there too. The cutting and grinding of the pieces was uneventful, and then the assembly began. The male parrot at the bottom took over two hours to fit into place. The tiny little pieces loved to move about despite being held in place with trusty horseshoe nails. My beautiful antique glass also posed problems due to being uneven in thickness. Then I accidently dropped my lead dykes on a large piece of glass (nearly gave myself a coronary) but they didn't break the glass. Time to walk away for the day at that stage! Back to it the next day and the assembly seemed to surge ahead after the previous day's hiccups. I used a variety of lead thicknesses and really liked the dimension it was giving. Nothing in nature is a carbon copy, so it worked out nicely to have the branches in a thicker lead and some detail in the parrots in a finer lead. Eventually the jigsaw of irregular pieces came together in a lovely, flowing design and I was happy with how organic the panel appeared. I was finally able to hold the panel up to see how the glass looked. King parrots are bright and gaudy, and the glass reflected that quality. My aunt was truly happy that I had captured her vision and I now have a matching set of four kitchen cupboards and a side entry panel in the works — all with king parrots in various natural poses. 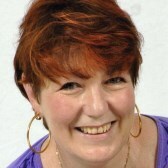 Cheryl has been drawn to all types of arts and crafts, including pencil sketching, pottery and porcelain dolls. She is a qualified teacher of hobby ceramics. 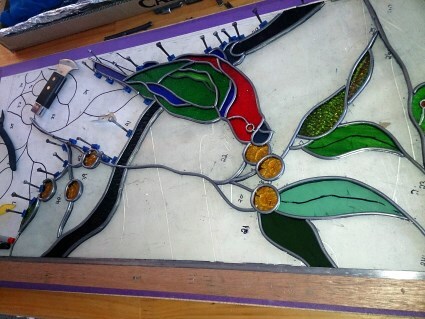 After moving to Queensland and seeing the beautiful leadlights in the heritage town of Toowoomba, it was only a matter of time until she tried the art of glass for herself. With her daughter in her first year of school and her husband working away for two weeks at time, Cheryl's time in the studio is treasured but limited. She is currently commissioned to supply glass urns for pet ashes and portraying pets in glass portraits. She can be found on Facebook at Moments in Glass and is only too happy to create personalised heirloom pieces.